Emphatically define your message with our above template which contains a graphic of confused person. This image has been professionally designed to emphasize the business concept and choice. This image has been conceived to enable you to emphatically communicate your ideas in your Business PPT presentations. Go ahead and add personality to your presentations with our high quality presentations. Deliver amazing presentations to mesmerize your audience. Break barriers with our 3d Man Confused Business PowerPoint Templates And PowerPoint Themes 1012. You will come out on top. 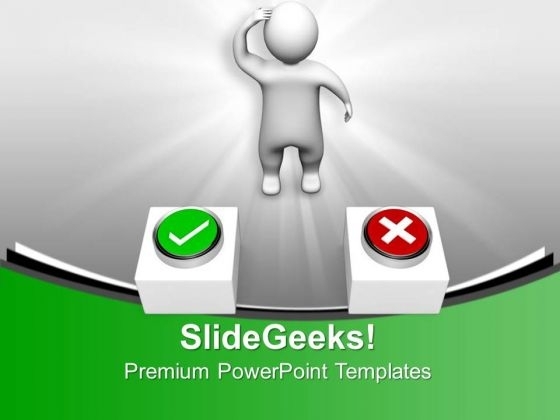 Correct the errant with our 3d Man Confused Business PowerPoint Templates And PowerPoint Themes 1012. They will willingly accept your advice.